The Sun (R) says look at your life realistically now – be perfectly honest with yourself. Stop day-dreaming and put some effort into reaching your goals. Before you become involved in any project investigate all aspects first. Ask yourself “Is this what I really want?” Do not allow anyone to “pull the wool over your eyes”! Disagreements and misunderstandings affect close relationships – they solve nothing and can cancel out future plans, which will result in disappointment. Allow the love in your heart to take the place of your fear. Your “ego” can blind you by its constant need for “more” – leading to overindulgence and burn-out, excess to the point of injury or illness. Begin to look at life as a continuous spectacle, spread out before you to enjoy and savor. Allow yourself the pleasure of every moment – for you truly need nothing more! Recognize that the good things of life are never really “lost” – they just become confused at times. You are still experiencing “simple” happiness – the clouds of doubt, confusion and fear have just overshadowed it and you can not see it clearly now, which forces you to work a little harder to realize joy -which is the greatest gift of the Sun. There may be too much exposure for your condition or circumstances – the risk of a burnout. This can mean a lack of realization/appreciation of your physical/material success and well-being, an overly conservative evaluation of your Physical Plane. Over production or under production. What do you now understand? What successes have you achieved? What have you brought to fruition? What joys are you sharing with others? What commitments have you made? In the first position: With your abundance of energy and resources you may be asked to help others find their place in the sun. In the second position: At one extreme, there may have been a tendency to overdo things in the past. At the other extreme, there has been difficulty with completion. In the third position – Others need your optimism and energy to help them realize this is their time to shine. In the fourth position: At one extreme, even this worthy passion can suffer distortion in the extreme, for spirituality must have its abstract components as well as hard reality. God is to be found inside as well as outside. At the other extreme, there is a dispassionate cloud over the heart toward people and/or nature. In the fifth position: At one extreme, you may be downbeat in your evaluation. At another extreme, you may be using your mental techniques to ill effect. In the sixth position: Same test, but with greater extremes. Here your relationships, or your creative affairs, must weather either outrageous good fortune beyond all expectations, or something much less than expected in your Physical Plane. In the seventh position: Here can be a fear of too much fight, too much exposure, too much success, a fear of happiness itself. What to do when all the enemies have been conquered, all the battles won? At the other extreme, can be the easier to understand fear of failure, of physical or material loss. In the eighth position: Too much energy; no need to over do it. Whether it’s too much exercise, or too much food, or too much work-slow down. At the other extreme, there may be too little energy. You can actually increase your energy by doing more of the right activities, a little at a time. In the ninth position: At one extreme, this may be forced or false joy. Or, you are not appreciative enough of your situation. 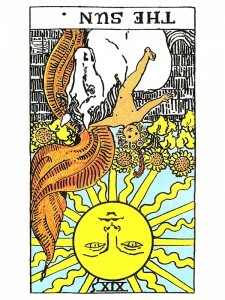 In the tenth position: You will be instrumental in the good fortune of many others. Hi, do you mean in the 10th position the sun is always positive, whether upright or reversed? What do you mean by being instrumental in the good fortune of many others? Thank you.